52" HighLong Solid Metal Cart Designedtaller mailroom personel so they don't have to bend over when sorting or retreavingmail. These cartseasy to pushmaneuver inoffice, mailroom, mail centerwarehouse. 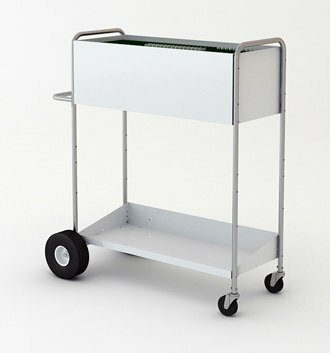 Built strong this cart is perfectwheeling over uneven tile floors or other rough surfaces. Featuresreartires4" front swivel casters.fileeasily holdslegal-size file folders (file folders sold separately) toyour delivery time in half. a locking-Part number 1645Y. Specifications: fileis 18 gauge steel with extra bendsrigidity. File railswrapped with stainless steelthe smoothest operationsliding file folders open. Triple weldedextra strength. Includeslower parcel shelf. Strong tubular steel frame. Chrome frontrear handles18 gauge steel - nickel chrome plated, durablecorrosion resistant.Dimensions: Overall: 49-1/2"L x 25"W x 52"HFile Bin: 40-7/8"L x 17-1/2"W x 13-1/2"H Lower Parcel Shelf: 40-7/8"L x 17-1/2"W xin front5" in back Color: Light grey with Chrome tubed handles. If you have any questions about this product by Charnstrom, contact us by completing and submitting the form below. If you are looking for a specif part number, please include it with your message.